the 2018 Phillips Society Luncheon. 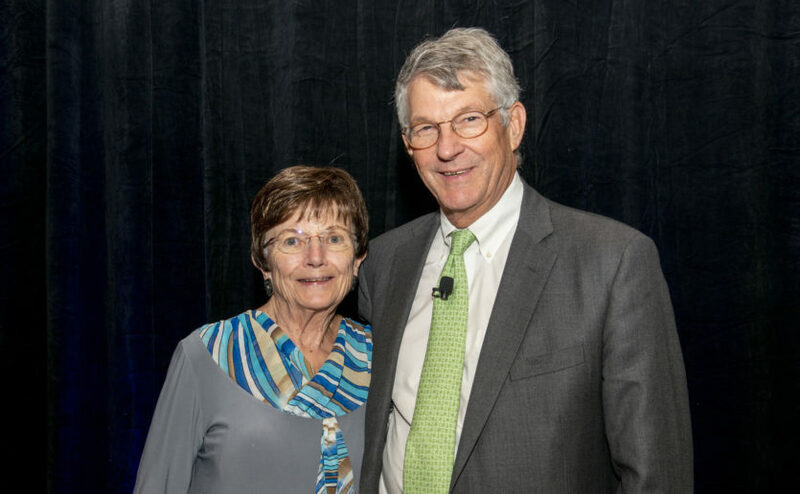 Remembering the names and faces of the 17 specialists who worked to help her husband makes Liz Morrill Cross proud of his gift to Mass General. For Harry Cross, Massachusetts General Hospital was a familiar place many years before he decided to become a donor. Mass General is where he was born in 1935, and it was the obvious choice for care when he became sick with increasingly complicated issues. An officer in the U.S. Navy, Harry Cross served in Sasebo, Japan, until his discharge in 1963. For the last 14 years of his life, Mass General also became a second home to his wife, Liz Morrill Cross. She still remembers the names and faces of the 17 specialists who worked tirelessly to help her husband, who died in 2006. She recalls his doctors stopping her in the halls to talk about Harry and invite her to coffee. But most of all, Liz remembers something else: “They would never give up on him.” That’s why she is proud of the gift to Mass General which Harry arranged many years ago. Liz and Harry met at the publishing house Prentice Hall, in its Waterford, Connecticut, offices. She worked with the vice president of advertising. He was a technical writer and educational film producer. Later, they moved to rural New Hampshire and enjoyed life together there. But when Harry developed symptoms of a pulmonary infection, they sought treatment at Mass General where, Liz says, infectious disease caregivers saved his life. Multiple hip replacements followed and kidney problems were revealed along the way. Harry’s nephrologist, Leslie Fang, MD, PhD, recommended a kidney transplant. There every step of the way, Liz was buoyed by Harry’s experienced physicians, who met each challenge with confidence. One-by-one Harry’s relatives were dismissed as suitable donors. So, at what she calls “the big meeting,” Liz herself volunteered to donate a kidney to her husband. Even in 1994, Mass General was the leader in non-related donor transplants, Liz notes. And the transplant worked for a while. Over time, however, other organs began to fail. Harry underwent heart valve replacement, lung surgery and a double leg amputation. Phillips Society member Liz Morrill Cross, right, attended the Society’s 2017 luncheon with a friend. When Harry’s uncle left him a trust, Harry and Liz discussed converting it into a charitable remainder trust to ultimately benefit his beloved alma mater, Yale University, and the Mass General transplantation unit. “I am thrilled that he made that choice,” Liz says. Until the assets are distributed to charity, the trust makes regular payments to Liz’ sister, who Harry also wanted to help. Liz hopes their contribution will further strengthen this world class program at Mass General. Division of Transplantation Chief James Markmann, MD, PhD, knows it will.